Balance, decisions, optimism, joy, adaptability, progress, weighing options. Through uncharted territories, Kangaroo leaps toward her goals. Additionally, she leaps at the sheer joy of being alive. Kangaroo’s strong and adaptable ways help her to balance the energies she needs to accomplish what she’s set out to do. 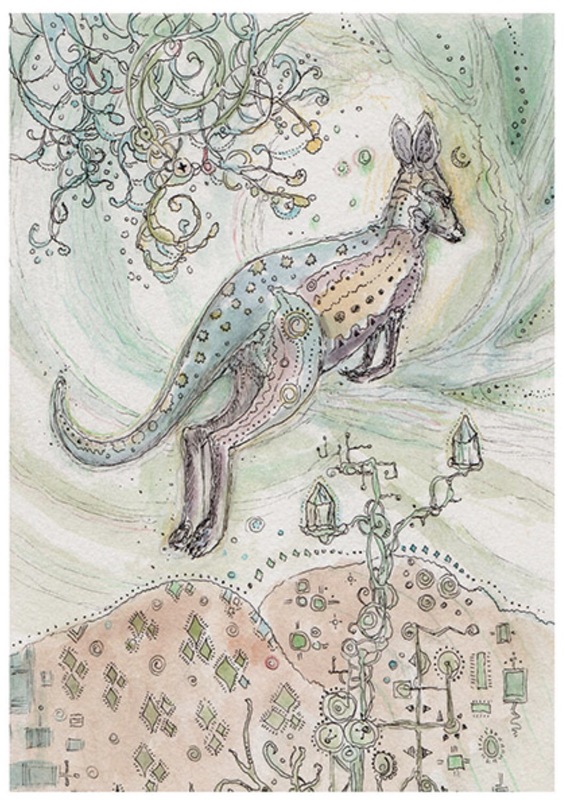 Kangaroo is here to remind you that challenges will be met when you’re flexible, and issues will be more easily handled when your mind is balanced. When dealing with more than one situation, remain centered and patient, and reflect before acting. The wheels of progress are turning, and you will intuitively know which direction to move in. Be creative with your resources, and take advantage of opportunities as they arise. This entry was posted in Artist, Deck Review, Featured Card of the Day, General Tarot, Readings and tagged 2 of Crystals, Kangaroo, Paulina Cassidy, Spiritsong, Tarot.